HPE Discover 2018 - Making Artificial Intelligence (AI) real - HighFens Inc. 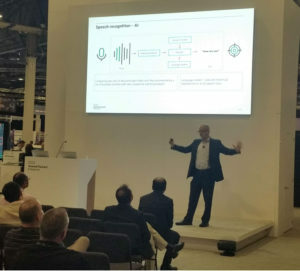 Speaking engagement at HPE Discover with Pankaj Goyal, HPE VP, AI Incubation & Data Center Strategy, to discuss how Artificial Intelligence can be used as a competitive advantage to help extract business value. During the session, Pankaj Goyal outlined the benefits of HPE as a proven leader in the AI revolution with a comprehensive portfolio, coupled with expertise and strong engineering partnerships. 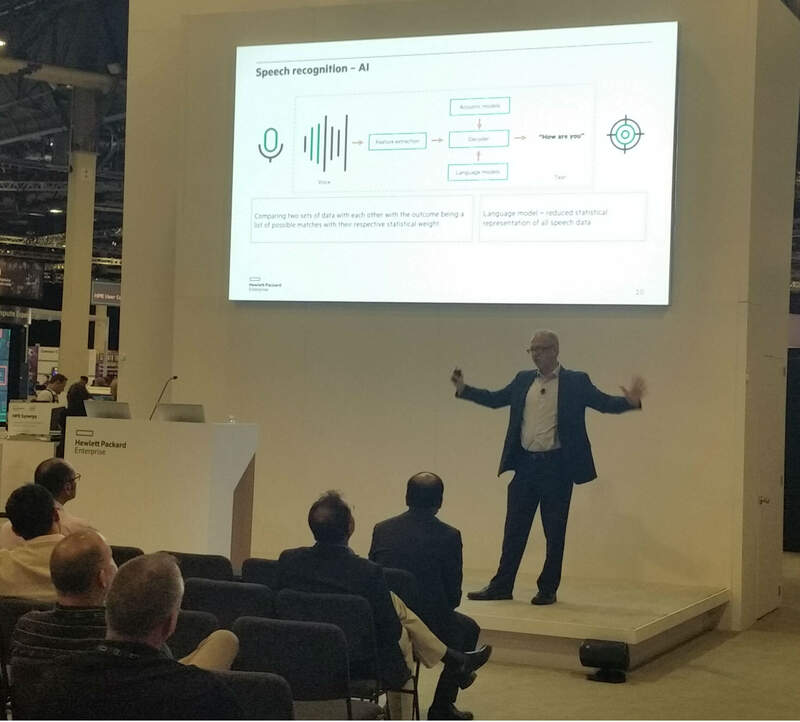 He followed up with HPE’s strategy and shared his personal insights along with examples of how AI is accelerating business innovation and value. Frederic spent over a decade working on improving Speech Recognition. In the presentation, he explained how the technology behind Speech Recognition has evolved over time. At first, it was mainly traditional High-Performance Computing (HPC) mixing in Big Data methodologies and techniques to address scalability. Because without a significant improvement in accuracy, Speech Recognition had very little chance to be accepted as an alternative way to interact with devices. With the introduction of AI and more specifically Deep Learning (DL) because of the ability to ingest larger quantities of data and the massively parallel processing capabilities. This delivered Speech-based products the much needed improved accuracy and the market acceptance to become mainstream. Today, most people use Speech daily as part of their routine in their cars and homes. Think of Amazon Alexa, Google Voice, and Apple Siri just to name a few. Although today Deep Learning is considered to be in its infancy Speech Recognition has been applying DL for years and has been a front-runner since then. Many of the AI problems today show similarities with Speech Recognition and can benefit from the lessons learned. After the AI presentation, Pankaj Goyal and Frederic were joined by Dr. Eng Lim Goh, HPE VP & CTO, HPC & AI, to have a discussion with the HPE Discover influencers around AI. The session was live-streamed by one the blogger’s YouTube channel called Geekazine. A link to the recorded video session can also be found below.